***This measurement will be very close to your ideal belt size. In this case, the size would be a 38". This will be the center hole on your new belt. We punch two holes on each side of the center hole for adjustment. *** Please make this measurement for your order form and do not assume that your pants size will work. Also, we do not use retail belt sizes for our custom belts . . . we need you to measure your current belt for us - thanks! 1 1/2 inch is a good standard width for MOST pant loops. 1 3/4 inch width is great for big men or for those who hang a holster or other heavy items from their belt. The extra width will help your belt hold up to heavy use and avoid stretching. 1 3/4" width also allows for more tooling area - floral patterns can be a little more "Striking" in this width. It's really not complicated at all. Here is the process that we ask that you use to ensure that you tell us the size that will fit you just right. Keep in mind that sizing a belt is somewhat less than an exact science and we do punch five holes 3/4" apart in each belt to allow for a significant adjustment. If you use our system, 99% of the time we get the size just right. After you have decided to make an order, the next natural question is, "What size do I need?" Get your hands on a belt you are using currently. 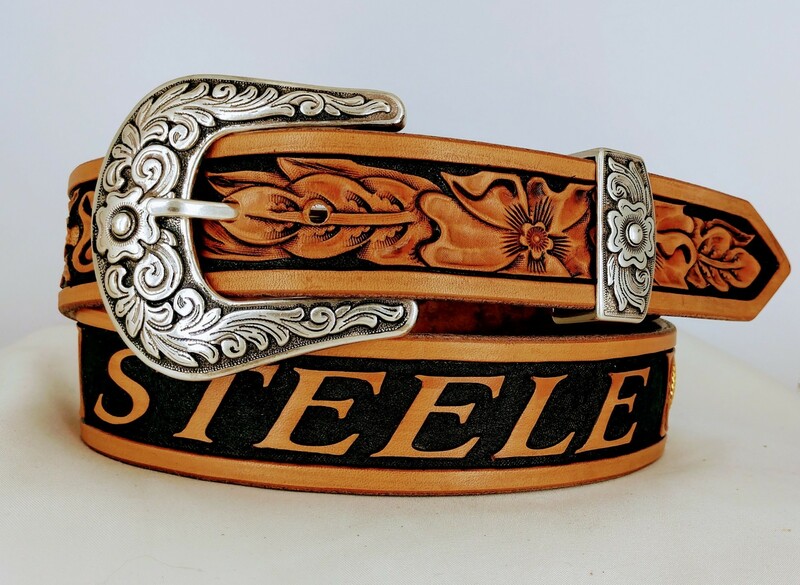 Will you use the same buckle on your new belt? If so, proceed. If you plan to use a different buckle, you will have to add or subtract slightly to the measurement: add the difference for a shorter buckle or subtract if you plan to use a longer one. For a more detailed explanation, click HERE. Lay your belt out flat on a table. Using a measuring tape, measure from the fold where the buckle is attached down to the hole you currently hook your buckle in the most often.